If you, like me, are a massive fan of podcasts and that fandom happily intersects with your love of comedy, then you’re probably already tuned in to the 2 Dope Queens frequency. 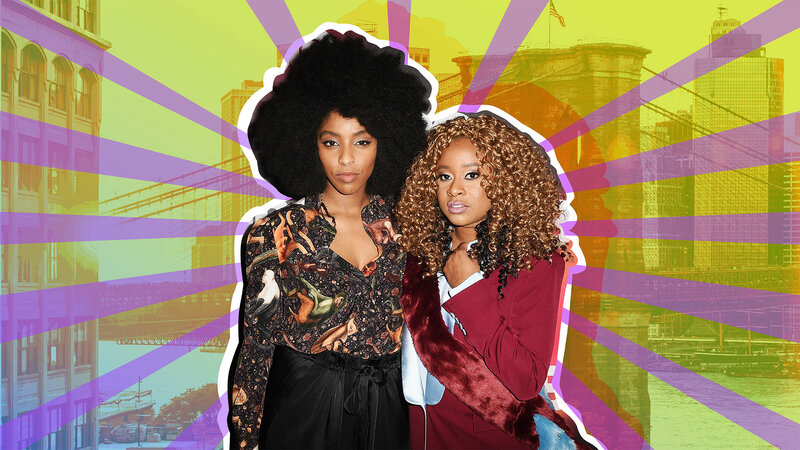 And if you’re not already, you should be, because the 2 Dope Queens podcast and the women behind it, comedians Phoebe Robinson and Jessica Williams, are slowly dominating the podcast and comedy worlds, respectively, with their work. Williams and Robinson have been the minds behind the 2 Dope Queens podcast for four seasons now, and they’re gearing up to bring their show to an even wider audience with a four-part limited HBO series. As a podcast, each episode is a recording from a live show where these cool women open up with a little banter back and forth before bringing comedians onstage so they can each do a short set. What’s great about 2 Dope Queens is that Robinson and Williams really wanted the show to focus on bringing non-straight, non-white, non-male (although it happens from time to time!) comedians into the spotlight. Now, 2 Dope Queens is ready to hit the big time with its HBO debut. According to Deadline, the 2 Dope Queens HBO specials are pulling no punches. Expect Williams and Robinson to get real and unfiltered about topics like “Blerds, Hot Peen, Hair, New York,” as Deadline summarized it, and to bring in stars like Hannibal Burress, Sarah Jessica Parker and Jon Stewart, Williams’ former Daily Show boss. It sounds like the HBO special of this hit podcast is going to go all-out with no holds barred, and frankly, I am all the way here for it. Just one look at the most recent trailer for the HBO special seems to confirm that Williams and Robinson are doing good work by bringing 2 Dope Queens to the masses. Ready to read more about the women behind 2 Dope Queens? Good, because if you keep scrolling, you’re bound to end up reading some pretty fun stuff. If you’re not already a major fan of 2 Dope Queens but still feel like you’ve seen Williams somewhere, then you’ve most likely seen her do her thing on The Daily Show. Beginning her run while Stewart was still on air and ending a short while after comedian Trevor Noah replaced him, Williams rose to prominence with her politically charged, edgy yet necessary takes on the sociopolitical issues of the day. Robinson doesn’t just act, write for TV and produce; she’s a published nonfiction author, too. Her book, You Can’t Touch My Hair (And Other Things I Still Have to Explain), was released in October 2016. Composed of personal essays touching on feminism, pop culture and race (all topics near and dear to Robinson), the book did well enough in its sales and promotion that there’s a good chance Robinson could write another one in the near future. At least, that’s what I’m hoping, anyway. A massive Harry Potter fan, Williams has previously described what it was like to actually meet Rowling, but the photographic evidence and subsequent caption (which is a borderline novella) really drive home the fact that Williams meeting Rowling might be one of the coolest things she’s ever done — aside from 2 Dope Queens, that is. In a 2016 interview with NPR, Robinson revealed that a career in comedy was never Plan A. Sure, life doesn’t always turn out the way you planned, but I’d go out on a limb and say that Robinson must be pretty happy with this Plan B.
Robinson is, of course, making moves on her own merit, but I’ll never say no to her teaming up with best friend — and solid feminist and comedic icon in her own right — Ilana Glazer to create some good comedy. While Robinson often cheers on Glazer on social media, the women have teamed up in the past to do shows together, and yes, Glazer does pop up on 2 Dope Queens from time to time. Love it. Not only did Williams get to meet one of her personal icons, but in October 2017, she revealed that she would be joining the cast of the Fantastic Beasts sequel in a still-undisclosed role. Even though fans have no idea who she’ll be playing, let’s keep our fingers crossed that she’ll be able to make us laugh while lighting up the big screen. Not only did Robinson work with Richard Madden on the upcoming comedy Ibiza, but she was also able to get him on the podcast to bombard him with Games of Thrones questions (because what else are you going to do when you have a hot GoT alum on your show?). One of the highlights from a 2017 NPR interview includes Williams revealing that she took part in a somewhat atypical purity ceremony when she was a teenager. It sounds like it left a serious impression on her. In that same NPR interview, Williams speaks about how she’s always felt like she had interests and places in both white and black communities. In this way, it’s profoundly shaped her worldview and her comedy. And there you have it: a primer on 2 Dope Queens and the amazing women who are making it possible. Are you ready to bask in the full glory of 2 Dope Queens when it hits HBO tonight? Because I sure as heck am.